Glenn Beck makes a lot of false claims, and it is usually impossible to tell whether he is being ignorant, spouting misinformation because he does not have a clue, or if he knows the truth and is intentionally lying. No doubt, that is the reason that media critics prove that he makes "false claims" rather than he tells lies. To prove that Beck intends to misinform rather than just makes unintentional mistakes, there has to be evidence that he knows what he is saying to be false. Two examples come to mind although there may be dozens or hundreds available to the diligent researcher with the time available to dig into his false claims. Beck claims that he has never attacked atheists. He certainly knows what he has said over the years, so if this can be proven false, then it certainly represents a lie and not an ignorant false claim. Apparently Mr. Beck does not realize how easy it is to check a simple fact as to whether he as attacked atheists in the past or not. All one has to do is to Google "Glenn Beck attacks atheists" to find many examples of his attacks on atheists. (This idea was suggested by "Lizinbklyn" on the Media Matters site.) How many results pop up? Dozens? Hundreds? Thousands? Tens of thousands? Keep going. Hundreds of thousands? Over a million? Keep going. To be fair, not all of the 2,240,000 results are pointing to Beck attacking atheists, but all it takes is one example to show that Beck is lying with this false claim. Google that phrase and see for yourself some of the examples -- a few of them are in video -- of Beck attacking atheists. As many times as Beck has purposely (mis)quoted Jefferson's letter to his nephew, Peter Carr, he does not actually question the existence of God; but that is another point. I just got this [tee-shirt] in. I didn’t even know we were making these. This is the slogan that I wrote for The Blaze. We’ve put it up everywhere here and we’ve written it out for The Blaze. And it is the truth has no agenda. And they just gave me this new T shirt and it actually has the original Blaze logo on it, ‘Stand in the Blaze’ on the back. Beck knew when he falsely claimed that he did write that slogan that he did not write it, so why would he make such a provably false claim over a demanding standard about truth? Typically, Beck's false claims support an agenda, but these two lies do not. Is Beck in the habit of lying? Is Beck's public persona a lie? Does he lie because of issues with his ego? 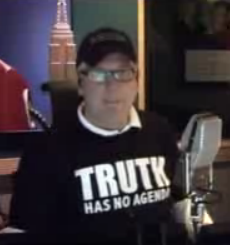 It is impossible to tell, but it is not impossible to understand: Glenn Beck is a liar. Aside from these two examples, many other lies have been documented by The Glenn Beck Report. The fact is, no matter what his reasons are, Glenn Beck purposely deceives his listeners and makes ignorant, false claims. 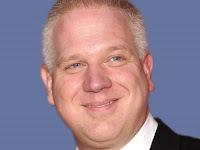 His adoring and gullible flock are in complete denial regarding Beck's dishonesty, but that only refers to Glenn Beck's genius as a reactionary propagandist. When Glenn Beck claims that he tells the truth, over and over again, he is lying. He is also exploiting an element of propaganda, repeating the lie over and over until people believe it. Unfortunately, some of his lies matter. Too many people believe Beck's false claims about climate change, and that contributes to the slow motion train wreck that is global warming. Truth may well actually have an agenda, since truth is always told from a perspective. Beck definitely has an agenda, the reactionary Koch brothers,' corporate agenda. That is just one reason Beck needs to be exposed as the liar he clearly is. The main reason is that people need to know the truth, honest stories about reality, not lies and propaganda that support a reactionary agenda.